The most commonly used PVC (formerly referred to as rigid nonmetallic conduit) is made of polyvinyl chloride, which is a thermoplastic polymer. Solvent type cement is used for PVC connections and terminations. • Schedule 40: Permitted underground (direct burial or encased in concrete) and aboveground (indoors and outdoors exposed to sunlight) where not subject to physical damage. Some Schedule 40 is marked for underground use only. Schedule 40 has a thinner wall than Schedule 80. • Schedule 80: Permitted underground (direct burial or encased in concrete) and above ground (indoors and outdoors in sunlight) where subject to physical damage. Schedule 80 has a thicker wall than Schedule 40. • The main differences between aboveground and underground listed PVC are its fire resistance rating and its resistance to sunlight (UV). • concealed in walls, floors, and ceilings. • in corrosive areas if the PVC is suitable for the chemicals to which it is exposed. • in wet and damp locations. • in hazardous (classified) locations except for limited use as set forth in NEC Chapter 5. • for support of luminaires. • where subject to ambient temperatures exceeding 122°F (50°C). • for electrical circuits serving patient care areas in hospitals and health care facilities, as the raceway does not provide an equipment grounding conductor as required by NEC 517.13(A). • in places of assembly and theaters except as provided in NEC 518.4(B) and 520.5(C). PVC conduit expands and contracts due to temperature changes about three times greater than aluminum and six times greater than steel. On an outdoor exposed run of PVC conduit, it is important that expansion fittings be installed to comply with the requirements set forth in NEC 352.44, where expansion characteristics of PVC conduit are given. 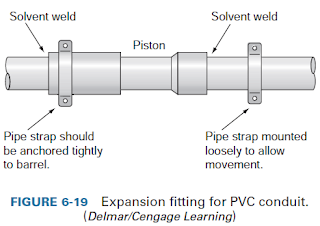 See Figure 6-19 for an example of the installation of an expansion fitting. Expansion joints or fittings are required if the expected length change is to be 0.25 in. (6 mm) or greater in a straight run between securely mounted items such as boxes, cabinets, elbows, or other conduit terminations. 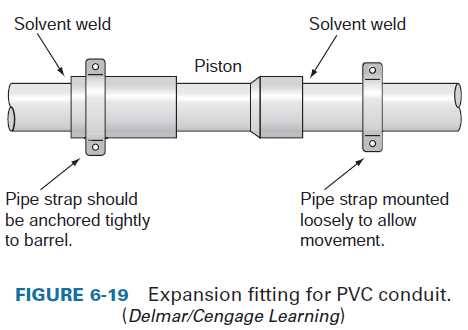 Refer to NEC Table 352.44 for the expansion characteristics of PVC conduit. There you will find that PVC conduit increases in length 4.06 in. (103.124 mm) per 100°F of temperature change. This means that a 10-ft (3.04-m) length would increase/decrease about 0.4 in. (10. 16-mm) for a 10-ft (3.04-m) length. This obviously exceeds the 0.25-in. (6-mm) length change requiring an expansion fitting. An informational bulletin on design and installation criterion is available for free download from the National Electrical Manufacturers Association . Also consider expansion fittings where earth movement will be a problem, 300.5(J). An equipment grounding conductor must be installed in PVC conduit, and if metal boxes are used, the grounding conductor must be connected to the metal box. See NEC Article 352 for additional information for the installation of PVC conduit. A complete line of fittings, boxes, and accessories are available for PVC conduit. Where PVC conduit is connected to a box or enclosure, a box adapter is recommended over a male connector because the box adapter is stronger and provides a gentle radius for wire pulling.